This post is part of an ongoing series. 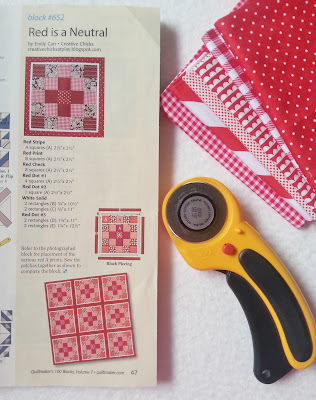 Follow along as I make blocks using designs from my pinterest board with hopes of a beautiful sampler quilt at the end. I'm excited to show you Block #8 today. This one is made using the instructions from my "Red is a Neutral" block that was featured in Quiltmaker's 100 Vol. 7. 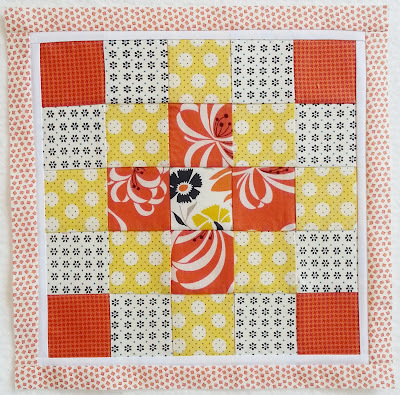 It's an easy block using my favorite 2.5" squares. It's a great scrap-buster if you are like me and have a basket full of pre-cut 2.5" squares. cut 2 - 3/4" strips by 10.5"
and 2 - 3/4" strips by 11"
Block should measure 12.5" after trimming. I will try to answer any questions you might have in the comments.